A couple of weeks ago I attended a birthday party for one of the sisters at the convent. She’s 100 years old. There were balloons, flowers, two sheet cakes and plenty of ice cream. Lots of people came. All the sisters, of course, as well as others who knew her and even a few – like me – who never met her before. I’m sure she didn’t care. It’s unlikely she has any memory of the event and given her blank stare, it was unlikely she had any awareness of what was happening. But she enjoyed her cake and ice cream. That’s the main thing. I sat at a table with three other employees. One of them has been working at the convent for 40 years(!) and she was the only one among us who really knew Sister Theodora. She told us a few stories. Sister Theodora was a very kind person who loved talking to people. She was trained as a nurse, spent her early years caring for children but found her true calling when she was moved to elderly care. Several times this employee would look over at Sister Theodora and say, “It’s so sad… it’s just so sad…” and the others nodded in agreement. I’m probably alone in this, but I didn’t see what was so sad. She lived a rewarding life, enjoyed her work, she made it to 100 and now she’s eating cake and ice cream. Okay, so maybe she doesn’t have memories of her past or knowledge of who she was as a person, but does she need them? What is better? To keep your mind and be aware of everything you lost—your health, your family, close friends—or to lose your mind and not count the loss? In other words, she doesn’t know what she doesn’t know. Why is that sad? As if our lives have worth only when we are of sound mind and body. As if that is what makes us who we truly are. All right, I’m going to drift off into a bit of God talk right now, so if you aren’t into that sort of thing, just scroll down to the next heading. I’ve been learning. One thing I learned is that Franciscans are real big on Humility and Contemplation. The key requirement for each is a self-emptying. Letting go of all those things you think make you who you are — your ego, your ambition, your work, your desires — and opening yourself up to fully experience God. They call this giving up your False Self in order to find your True Self. Another thing they’re big on is that this is a continual process. They call it Continual Conversion. It’s ongoing. We can never fully achieve it during our lifetime, but there is joy in the trying so we keep at it. I want you to know these aren’t wholly new concepts for me. Protestants also speak of emptying ones self, but we tend to breeze over it because it makes us uncomfortable. It smacks of obedience and frankly, we’re not real big on obedience. Even so, I’ve been giving it a go and so far my progress has been… um… maybe “progress” isn’t the right word. Let’s go with “inching forward at a snail’s pace.” Yeah. That sounds about right. Emptying myself by inching forward at a snail’s pace is going fabulous. Absolutely fabulous. Okay, let’s breeze over that for the time being. What I really wanted to say was that the morning after Sister Theodora’s birthday party, this popped up on the app I’m using for centering prayer. It’s by St. Ignatius – the founder of the Order of Jesuits. That guy. Take note of that second line: “my memory.” Even that. Are we willing to give up that? Fact is, we may not have a choice. We can (and should) take care of our bodies, eat well, exercise, yada-yada. But even then, our genes or our environment or whatever will have the last say. We entered this world not knowing anything, we may very well exit it not knowing anything either. One way or the other, we are emptied. But to empty oneself willingly, that’s what old man Ignatius was talking about. Remember the chief goal: we are emptied in order to be filled. The more I think about it, the more I believe we should consider this phase Sister Theodora has entered not as sad, but as sacred. She will soon achieve her True Self and return to God. She has entered a time of Holy Returning. Does this sound foolish? If so, I’ll gladly play the fool. Sister Theodora didn’t stay long at the party. They say she’s not fond of big crowds so once she ate her cake and ice cream, her nurse took her back to the second floor — the Memory Care Unit, where her and five other sisters live. Sitting at the table was one of my bosses — I have two and they’re a married couple, so we’ll call him Mr. Boss. I rather like how he put that, don’t you? And you know, from what I learned about Sister Theodora, I’m pretty sure she’d like that too. A protestant took part in a Catholic Eucharist. In other news: Hell did not freeze over. It happened last Friday, March 1. The convent’s “Founding Day.” The Mass was a special one and many people attended. Sisters from far away attended. Employees of the convent attended. Then we segued into the Eucharist and in all honesty, Catholics are masters with the segue. It’s seamless. There was another song and people started walking forward. I was about to sit down because, you know. Not Catholic. Only I noticed everyone was walking forward. Everyone. Even the non-crossers, whom we presume are fellow protestants. I grew up in a Catholic neighborhood. I had Catholic friends. I know the drill. Only Catholics. Never me. But these Franciscans have been described as radical. So maybe? Which is a marvelous way to put it, don’t you think? Speaking of dinner, there was one after the Mass and it was free. Fried chicken, mashed potatoes, green beans, several salads including a “copper coin” salad. A dish that will forever change my view on cooked carrots. For dessert, apple pie. One of the Sisters passed away. Deaths are announced quietly here, by way of a little slip of paper on the entrance to the convent. It was a Sister I’d never met before: Sister Bernarda. She was 102 years old. She had been a registered nurse and hospital administrator. Other Sisters reported she was always dignified and direct, and took care to present herself well and look her best. They also said she was very patient and kind to young nurses in training, had a charming sense of humor and was loved by all. They truly have a different view of death. This is the news, folks. I’m not making this up. Yesterday was Donut Day. Also known as Shrove Tuesday. So apparently this is a thing? Honestly, I had no idea. Growing up Lutheran, every day was donut day. But for those whose Lenten tradition meant giving up decadent food, all that fat and sugar had to get used up. Hence, donuts on Shrove Tuesday. Full disclosure: I’ve never had a donut as good as my Grandma’s. They arrived on your plate literally moments after she pulled them from the fryer, crispy and golden and oh-so-good. Never too sweet and perfect for dunking in tea. But these, my friends? These came close. Really, really close. 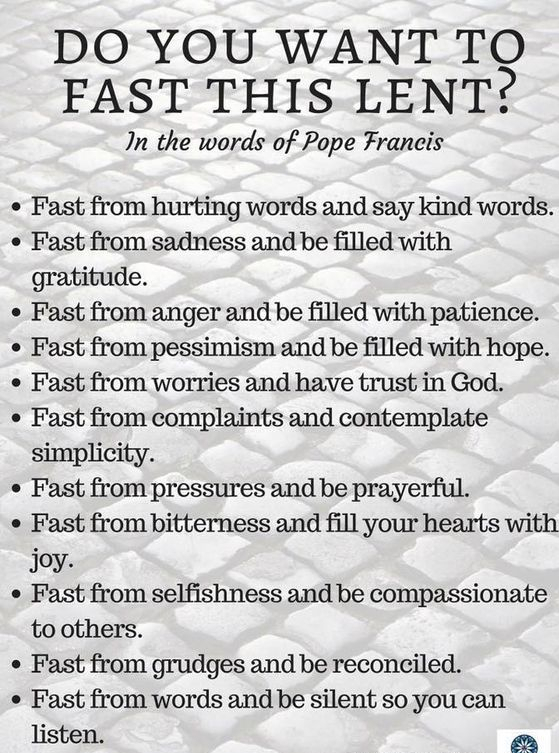 Speaking of Lent, not sure if it’s your custom to give up something – it’s not mine, but I always liked the notion strictly for the challenge of it. Anyway, came across something that might be the most difficult challenge I’ve seen. It comes from Pope Francis. Even if we aren’t 100% successful, I rather think if we all just attempted these, we might change the world. On a post about five or so months ago, where I told of my relocation up North, I ended by saying I got a job at a hospital near our house. Maybe you wondered why I never mentioned this job again? Or maybe you never thought about it, which is completely understandable because why would you? The reason I never talked about the job was because 10 days into said job, I quit. Have you ever started working at a place and as you stood there watching the other employees do their thing, know deep in your heart it’s not your thing and never would be your thing and what in God’s name ever made you think it could be your thing? Also, what I was told would be my schedule turned out to be more theory than practice. It might one day be my schedule, but for now it was anything goes. So I went. What followed was a time of self-reflection, doubt, and existential malaise. Or, what is commonly known as, a job search. I forget how many interviews I had. Or how many times Indeed-dot-com notified me with: “______ looked at your resume!” Without bothering to note that “_____” was in California or Florida or Guam. I tried to stay positive. Hey, with all this free time, I can write blog posts galore! Resuscitate its Facebook page, update the blog theme, tidy up the sidebar! Gosh, maybe I’ll even dig out that novel I’ve been working on for… oh gee, I don’t know… 15 years? Hey, now I can be a full-time writer! Oh, if only I had a smoking jacket! Or smoked! Administrative Assistant with desktop publishing and database skills; ability to write and format newsletters; creativity and good writing skills a must; knowledge of video editing software a plus. Please send letter of introduction with resume. Must be knowledgeable of Franciscan spirituality or willing to learn. Forgot to mention, the job was at a convent. So, yeah. I’m working at a convent now. Have been for a little over a month. It’s a fascinating place. I don’t mean to put down men—honestly, I love you guys—but there’s something about women who choose to live without them. It’s like they come into their own. The couple I work for–they’re a lay couple who oversee two of the convent’s ministries–they give me books to read so I can understand their work better. They reserve a quiet room for me, I can get free popcorn at the convent’s top-notch cafeteria. We meet afterwards to discuss what I read. It’s like I’m getting paid to attend a book club. Things I’ve learned: St. Francis was a radical. And here I thought he was just a guy who liked birds. These nuns can be pretty radical too. Never before have I worked with a group of people who are so focused outwardly. Even things like tossing a piece of paper in the garbage—Wait! That can be recycled!—Wait! Did we write on both sides first? The woman I work for, let’s call her Mrs. Boss, said if anything were to happen in town—if some injustice was occurring—these sisters would be the first ones marching out the door, carrying signs in protest. And I can see it happening, too. Though it would be a slow procession, given their ages and several using walkers. Such is my life now. Living in a blue state, working among Franciscan nuns.